Not every bunker shot is alike. Sometimes we end up in lies on the very edge of the bunkers that have a little bit of grass and sand mixture. Sometimes tight, sometimes fluffy, these lies are very unpredictable, and even if there’s little to no lip to deal with, advancing the ball in the direction and distance you want to takes some careful consideration and strategy. It’s really a combination of shots. We are going to play this like a fairway bunker shot by moving the ball back in my stance a little. The key to uneven lies like this is to make sure that you have good footing. If your feet move, it makes it hard to get into a good impact position. I will take an extra club to make sure that even if I mishit it, I have enough club to get to the green. 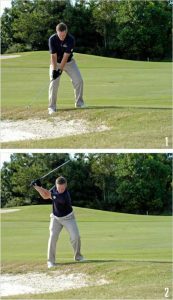 Depending on the severity of the uneven stance you may have to take two clubs more and just take an easy swing and keep my footing nice and stable, as I do through the swing sequence shown here. By keeping your feet stable this will restrict your follow-through and can cause the ball to fly a little lower than normal. Take these considerations into account when playing these shots. 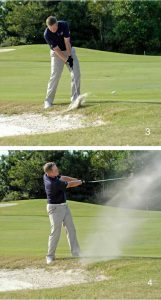 Don’t be afraid to attack the ball with a strong descending taking a little sand in the process.